It’s akin to celebrating Quebec Cuisine and having people dressed in Frog costumes as Frederic Serre(whose mother was Italian) wrote in. 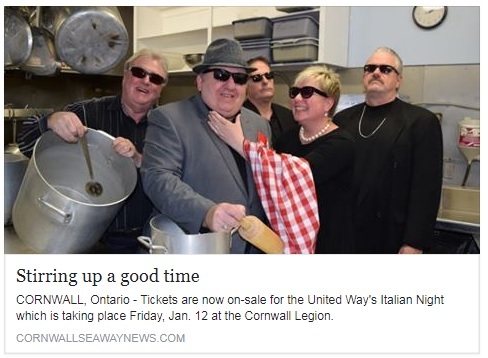 “It is hard to fathom how, in 2018, in this age of social awareness, such a respected organization like the United Way could stoop so low as to dip into a tiresome, negative stereotype about Italians to promote their fundraiser. What’s their theme next year? Blackface? Frog costumes? I would assume that the United Way fundraiser organizers actually sat down and brainstormed — and this is the best they could come up with? The crew is stirring up something good for this year’s Italian Night. Pictured from left-to-right are: Rocko, Don Ricardo, Billy Maraschino, Mama Grazi and Thomasi Racino (Nick Seebruch/ TC Media). Referring to Rick Shaver, his boss, as a “Godfather”. Kevin A. Caira, National President of the Commission for Social Justice, OSIA (Order Sons of Italy America) based in Washington DC telephoned and asked if any of those pictured were actually Italian? On behalf of his organization he sent in the following statement for publication. It is unfortunate that in 2018 there continues to be negative stereotyping towards groups of all ethnicities. The Order Sons of Italy’s Commission for Social Justice fights against bias, bigotry and stereotyping of any kind, especially against Italians, Italian-Americans and Italian-Canadians. We do not condone the type of image that the City leaders of Cornwall are portraying in their upcoming fundraiser for the United Way. We see these negative images of Italians on social media, in movies and on television much too often. Italians, Italian-Americans, and Italian-Canadians have had a positive impact in every field of our society, and it is time for the media to portray their contributions accordingly. I encourage those involved, particularly public officials who should know better, to abandon their offensive plans and improve upon their good intentions by promoting a more appropriate fundraising activity. I trust that an honorable institution such as the United Way would not object to such a change. The event had been run under the MS Society banner for over ten years before the United Way took it over this year. The local United Way, has failed to reach its funding targets for several years under Ms Greer, simply has no target this year and instead is adding events like this. We reached out to Cogeco, TC Media, and the United Way Centraide’s media relations for comment as well. As a national office, we aren’t involved in local volunteer fundraising events. I see from the email trail below that you’ve already reached out to the local United Way. We’re expecting more responses as many are still on holiday breaks, and will be updating this story. One insider says that after its few first years the group toned down the event as they clearly knew that it was over the line, yet felt that it was fine in its current incarnation. The bigger question is will these community leaders and large corporations apologize to the Italian community and kill their event and change it to a different theme, hopefully without offending entire Nationalities or groups? What do you think dear CFN viewers and our friends in the Italian community. You can post your comments below. Presto! … More dumb f’ing clique hangers-on than you can stomach. Those that are not interested in play should just not show up, as for it being 2018 lets have some fortitude and common sense, there nothing offensive about add, people in Canada really need to give there heads a shake. Grow up all you so called bloggers. Mr. Primeau you have to post with your first and last name as per our guideline. I wonder if people in Cornwall would be offended if they were portrayed as uneducated, incestuous, ill mannered, hard drinking, drug crazed illiterate lazy welfare cases. Judging from the Italian Night decision perhaps they would simply see the humour in their “stereotype” image. It’s pretty bad when you have to steal tasteless jokes that put down your community…. Maybe next year they could have a Muslim night and they could all dress up like terrorists. Aren’t stereotypes just so much fun? These are really smart people doing great things to represent Cornwall. Or German night and dress up as the Gestapo. Some people just don’t get it and then when they do they get all angry at the messenger. It’s like trying to tell some people in Eastern Ontario that you’re not supposed to impregnate your own children. That just never goes over well…. please re read the guidelines – there are some people grandfathered in with user names and we have an option to allow it to go through if it’s not nasty like yours Mr. Primeau. 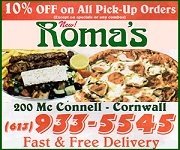 Many persons who have settled in our City having Italian heritage are excellent workman , and while the intent of the Fundraiser has merit they have run head on into the political correctness movement and end up being taken to task . thank you for posting Sheldon, but sadly you’re utterly wrong about Italian night and need to do your homework as I never called for any boycott of Tim’s. Vive Les Italien, let the show go on, maybe when your mayor ADMIN(with the 4 votes you got last time around) you can then decided which plays and who gets hired around town, dont think we’ll have to worry about thought…. Mr. Primeau it’s not the mayor’s job to teach people like yourself decency and how to behave without being racially offensive.